CAN232 is a very small dongle that plugs into any PC COM Port, or any other RS232 port in an embedded system and gives an instant CAN connectivity. This means it can be treated by software as a standard COM Port (serial port) which eliminates the need for any extra drivers. Send and receive can be done in standard ASCII format. LAWICEL sets another record in speed and performance with the new CAN232, built on same base technology and know-how as the original version. The new CAN232 comes with more memory, 4 times faster microcontroller, new commands and possibilities for the customer to update the firmware for free in less than 5 seconds without opening the case. Initial tests at customers and at LAWICEL shows that the troughput has more than doubled compared to the original version of CAN232. We have now tested it by shooting 500 frames per second with standard 11bit ID's and 8 databytes using 115,200baud RS232 and no single frame is lost during a whole day. Another test was done shooting 1000 frames per second with standard 11bit ID's and 2 databytes and same result, not a single lost frame. In the initial release of the new CAN232, we have increased the receive FIFO from 8 to 32 messages, added time stamp on the messages in milliseconds (option to be backwards compatible with original version) and optimized the CAN core functions for speed and memory usage. Further more we have added the "Auto Poll" function, which can be set with a command so incomming CAN frames are sent directly out on the RS232 without the need of polling them manually. Finally we added a bootloader in the new CAN232 which makes it possible for the customer to update the firmware inside the CAN232 to new versions/features that we develop (the original version had to be sent to us for update). This bootloader also makes it possible for either the customer to make their own software for the CAN232 or that LAWICEL can do customizations and add more functionallities without sending the hardware arround the world. Excisting users with the original CAN232 cannot benefit of these new features, however LAWICEL can upgrade the hardware in their original CAN232. Contact LAWICEL or your local dealer for more information about this. The new CAN232 is now availible. We will update this site in the next weeks with more information, updated demo programs and manuals, so check back often during the next weeks. Click here to get to the new CAN232 version (info, drivers & sample programs). Dealers selling CAN232 can be found here at the LAWICEL Dealer Page. 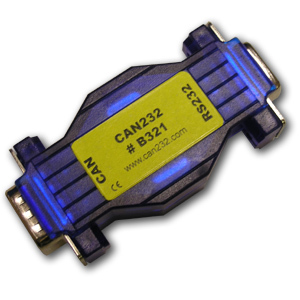 CAN232 is a dongle that plugs into any PC COM Port, or any other RS232 port in an embedded system and gives an instant CAN connectivity. This means it can be treated by software as a standard COM Port which eliminates the need for any extra drivers. Send and receive can be done in standard ASCII format. Dimensions Length: 68mm, Width: 31mm, Height: 16mm. Features The module plugs directly into a standard serial port and provides a standard DB9 male output to CAN systems according to CiA (CAN in Automation) recommendations. It is powered with 8-15VDC through the CAN connector with ESD protection and reveresed power. It consumes max 100mA, but normally not more than 40mA (this depends on BUS load and eventual CAN cable errors etc.). Use your own RS232 LIB/drivers (in e.g. Visual Basic, Deplhi, C++ etc.). Figure 1: Pin assignement according to CiA recommendations DS102-1. The CAN232 is powered with +Vin at pin 9 and GND at pin 3. CAN232 Monitor software is written in Delphi version 5 and is a simple tool to send and receive CAN frames at any given standard CAN speed and COM port. The software polls the CAN232 automatically at 100mS interval and an eventual frame is automatically listed in the window. It is also possible to send frames from it by setting up an ID, Data length (DLC) and 0 to 8 data bytes in hex. The software comes with full source code and uses a freeware LIB for the RS232 communication (see below for links to the RS232 LIB). This free version is free to use and modify to suit your needs and we cannot give any support on it or the RS232 LIB since it is freeware. To be able to compile and change the code you need the RS232 LIB as well. If you only need the executable file, just download the ZIP file and unpack and run the CAN232.EXE file. Soon there will be an extended version with full source code as well, which enables faster polling, logging to file and much more plus support from us. All this for a small fee, check back soon for more information. Download ZIP file with Delphi Project and Executable file. We originally developed this using version 2.6.3 of Dejan Crnila's ComPort LIB, however his original Website has disappeared from the web, after a bit of research we found out that the project has moved to SourceForge and is now developed by several peoples. A new version is availible which we havn't tested yet with the Delphi Application. We will do this soon. Visit Dejan Crnila excellent TComPort Library for Delphi & BC++. CAN232 Project in C for Linux is written by Attila Vass from USA. He has made some excellent programs for the CAN232 such as a Acceptance Register Calculator, Data Collector and Logger and much more mainly to be used to log CAN from 04 Prius, however much of the general source code could be used as getting started with C & Linux. All source code and information could be found at his site. These C files can be ported to e.g. Windows platform or any other C environment, since all source code is included. Currently LAWICEL cannot answer any support reated questions of this project, contact information can be found at the site below. Visit Attila Vass 04 Prius Project. CAN232 Project in C++ for Linux written by Svenn Rnnbck of LuleÂ University of Technology in Sweden. This project will use socket communication for the CAN232, so it is actually possible to be anywhere in the world to control the CAN232 through sockets. There will be a JAVA client for it as well soon. More information will be here and also on the link below as the projects delelops. The code is under the GNU licence. There will soon be a readme file there to describe the project more in detail. These C++ files can be ported to e.g. Windows platform or any other C++ environment, since all source code is included. Currently LAWICEL cannot answer any support reated questions of this project, contact information can be found at the site below. Visit the CAN232 Linux C++ Project. CAN232 software is written in VB version 6 and is a simple software to demonstrate how to "talk" to the CAN232 in Visual Basic. To be able to compile and change the code you need the VB6. If you only need the executable file, just download the ZIP file and unpack and run the CAN232.EXE file (Note however that you need the VB6 runtime files to be able to run it, we didn't include them here to save space and bandwidth). Instructions are in the frmMain.frm file on how to use the sofware. Download ZIP file with VB6 Project and Executable file .